1986-87 Kraft Drawings Hockey cards are some of the most beautiful the hobby has ever seen. Featuring a strong checklist that includes one of the first Patrick Roy cards, it's also one of the best oddball sets of the modern era. The 81-card set focuses exclusively on the NHL's Canadian teams. Card fronts have a charcoal illustration where players are portrayed in multiple poses. The most prominent image is a player portrait. Two or three full-body action poses surround the portrait. All of the images are contained within an oval. The majority of the artwork is by Carlton McDiarmid and Jerry Hersh. The bottom-left of the card has the player's number, name and a Kraft Sports logo. A color team logo is on the opposite side. Card backs include details on a special mail-in offer. Collectors could send away for poster-sized versions of the cards that measured 16" x 20". Single prints cost $3 plus one UPC code from a Kraft product. Team sets of 10 prints cost $10 and ten proofs of purchase. A 20-print set of the Montreal Canadiens, the 1986 Stanley Cup Champions, was $20 and 20 UPC codes. Four over-sized Canadiens prints exist that weren't originally issued. These include Shayne Corson, John Kordic, head coach Jacques Lamaire, and assistant coach Jacques Laperriere. 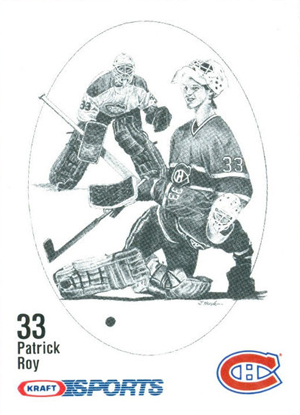 All 1986-87 Kraft Drawings Hockey cards have two different versions. The first has a white back. These cards originally came packaged inside select Kraft products wrapped in cellophane. Cards are also available with a thin, brown cardboard back. These cards were attached to boxes. 1986-87 Kraft Drawings Hockey is notable for its checklist. While it's limited to players from Canadian teams, it has rookie-year cards of several standout players. While oddball cards aren't seen as official rookie cards, these are still desirable to collectors and a nice alternative to the standard O-Pee-Chee and Topps releases. Patrick Roy, Wendel Clark, Mike Vernon, Russ Courtnall and Stephane Richer all have rookie-year cards in 1986-87 Kraft Drawings Hockey. Kraft also issued an album for the set. 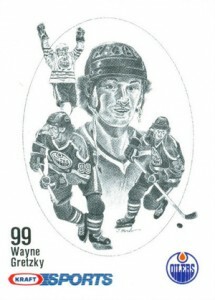 1986-87 Kraft Drawings Hockey was the food maker's first foray into the Canadian hockey card market. Although it would be a couple of years before their next set, Kraft hockey sets became a staple throughout the 1990s and into the new millennium. 1986-87 Kraft Canadiens Team Set in Cello - Patrick Roy Rookie! RARE 1986 87 KRAFT DRAWINGS NHL HOCKEY CARD POSTER WENDEL CLARK ROOKIE SHARP!! PARALLEL CARDS: Prints - mail-away offer. Each measures 16" x 20".